Every craft takes practice, patience, perspiration and inspiration. 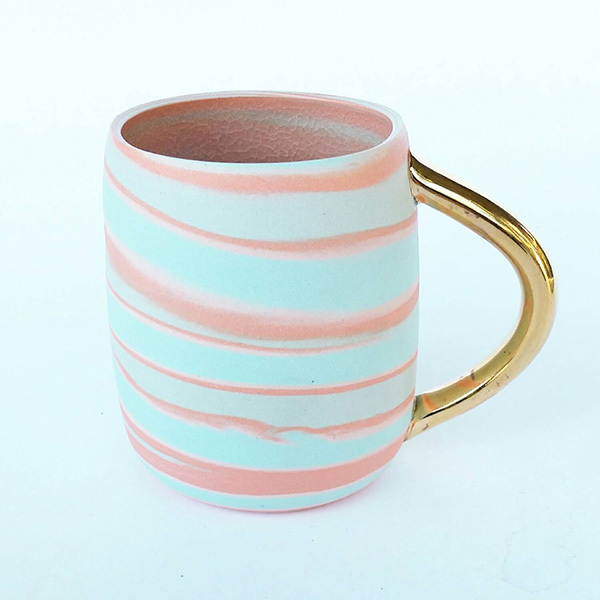 The art of ceramics—one of the most ancient of arts is no exception. 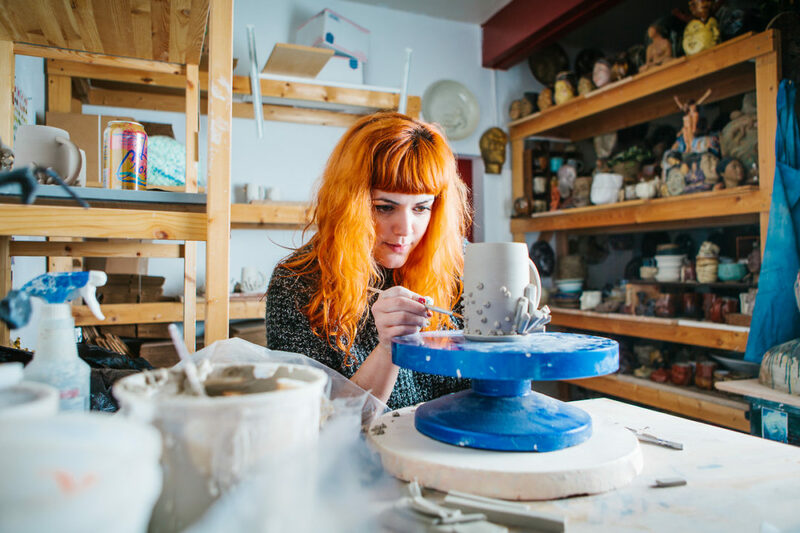 In her Seattle studio, Katie Marks wets ordinary clay, and creates everyday objects that are extraordinary works of art. 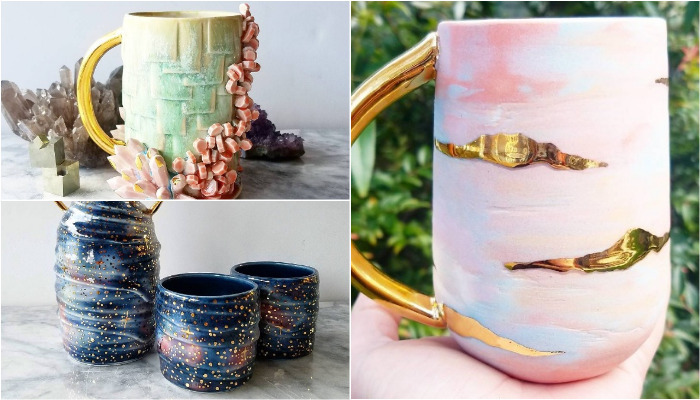 While Katie has a mentor, professional ceramicist Matthew Patton, and has had some formal training, she credits most of her initial ceramics learning to the power of the internet–watching youtube. After seeing the world Katie Marks envisions through her pieces, I think it is safe to say we all would love to live there. Each piece has a unique way of combining the terrestrial and the extraterrestrial, making her imaginative fantasy land feel like it could actually be an existing alternate universe or a piece of organic material from another galactic planet or 4th dimension. Katie does not do commissions or wholesale orders. I personally find that refreshing and brilliant. In my opinion commissions and wholesale orders would effectively stymie the creative process. It elevates each piece to a true work of art, not something imagined by anyone else or mass produced. 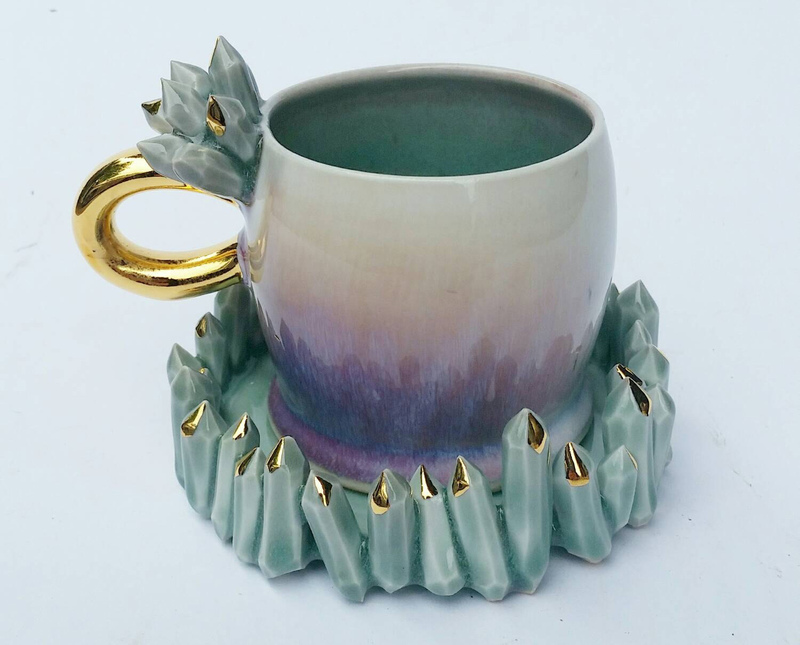 Katie announces when her next batch of ceramics will be posted on her etsy shop “Silver Lining Ceramics” on social media. If you are interested (and let’s be honest, who isn’t? ), her newest collection will go live on Etsy this Friday, May 5th at 3PM PST. As these immigrants traveled from Bohemia throughout Europe, they became known as Bohemians. They were nomadic by nature, and quick to assimilate into the cultures they traveled to. Fast forward 500 years to a spring day in another sanctuary state: California. A group of journalists gathered in the Astor hotel in San Francisco to start a club comprised of artists, authors and philosophers whose aim it was to leave the cares of the urban world behind them and reflect on the higher things that made life worth living. The club needed a name that aptly described its members and its mission. It became known as “The Bohemian Club”. Isn’t it interesting how words are shaped and evolve through time to express ideas, and communicate thoughts and feelings? Bohemian. Think it. Say it. What comes to your mind? Maybe you think of the peace, love, and Donny Osmond era; San Francisco flower children; and lots of macramé. Maybe you only go back that far. Back to the 70’s when the word Bohemian was synonymous with the word Hippie. Or, maybe you go further back. Back to the roaring 20’s; back to Zelda and Scott Fitzgerald, flapper culture and feminist awakenings; back to anti-establishment speakeasies and abstract art. That was a time when cubism was just coming onto the scene, and philosopher Albert Camus’ absurdist writing was giving a voice to what many were contemplating about existence. Or, maybe you stay right here in the present day. You think about digital nomads, location independence, and hipsters dressed in Urban Outfitters chic. Side question…are hipsters really Bohemian? Or, are they Fauxhemian (posers trying to look like the real thing)? What does Becoming Bohemian even mean? Can it be clearly defined? Is the fact that there is no clear definition itself descriptive of what a Bohemian truly is: something that has no box, no home, and no label? 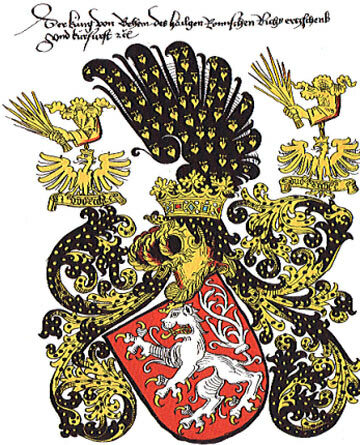 While difficult to pin down with any degree of specificity, one common thread woven through history as far back the Kingdom of Bohemia emerges, and that thread is freedom. Bohemianism is all about freedom: freedom from oppression, freedom of thought and expression, and freedom to explore the world. I want to become Bohemian because I want to be truly free. I want to become Bohemian because I want to live rather than simply exist. I want to become Bohemian because I honestly don’t see any other alternative. This is the lifestyle I wish to cultivate. If the ultimate existential question is “to be, or not to be”, the answer to all of that existential angst, I am convinced, is to become Bohemian. I plan to explore Bohemianism through the lenses of my Bohemian Idols: artists, thought leaders and philosophers, innovators, world travelers and anthropologists. I will write about my findings here. Do you want to join in the quest to Become Bohemian? Subscribe to be a part of the community, and receive our monthly newsletter. In addition, if you have a Bohemian Idol you think I should research, please let me know in the comments below. We knew it would be great. It just had to be. Standing on the platform at Poroy Station, you couldn’t help but be impressed by the beautiful blue and gold spectacle there on the tracks. 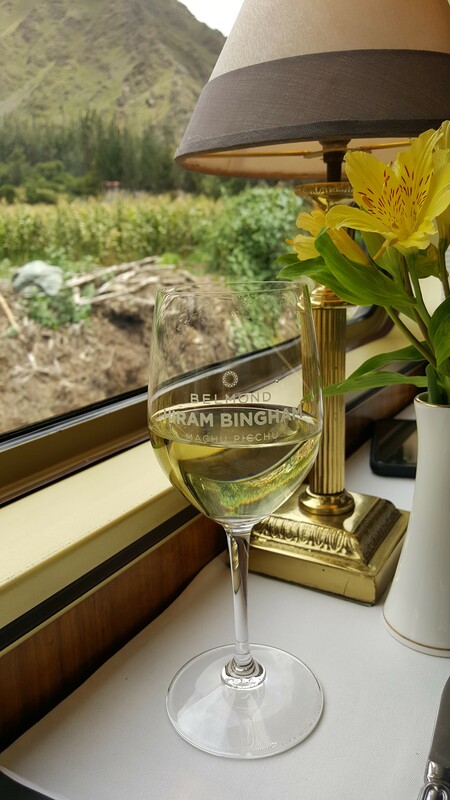 It was once an Orient Express train; now it is known as the Belmond Hiram Bingham train to Macchu Picchu. Greeted with Intipalka Extra Brut sparkling Peruvian wine and white glove service, we were shown to our seats and told by the maître d’ that our luncheon would be served promptly at 11AM. 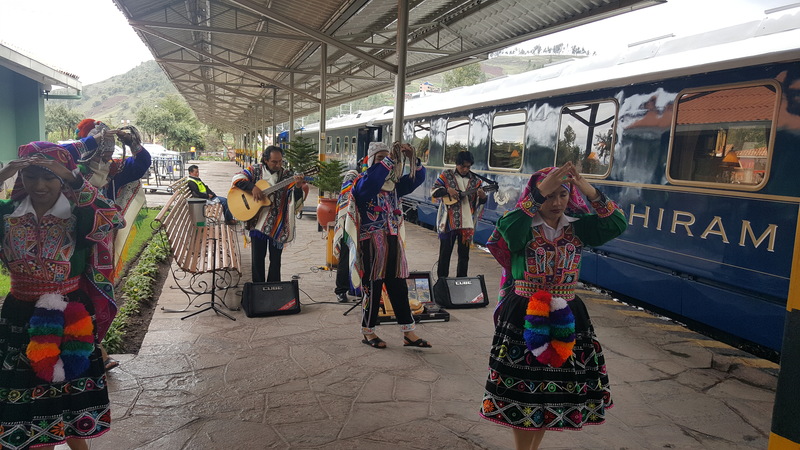 Through the window, we could see the dancers on the platform dressed in colorful Peruvian alpaca woven wool costumes twirling to pan pipe music and drums. Soon the train whistled and, at the sound of a bell and steam rushing out from the engine, we began our journey through the sacred valley and onto the ancient ruins of Machu Picchu. We had a couple of hours before lunch would be served. So, we made our way to the back of the train where the bar car was located. 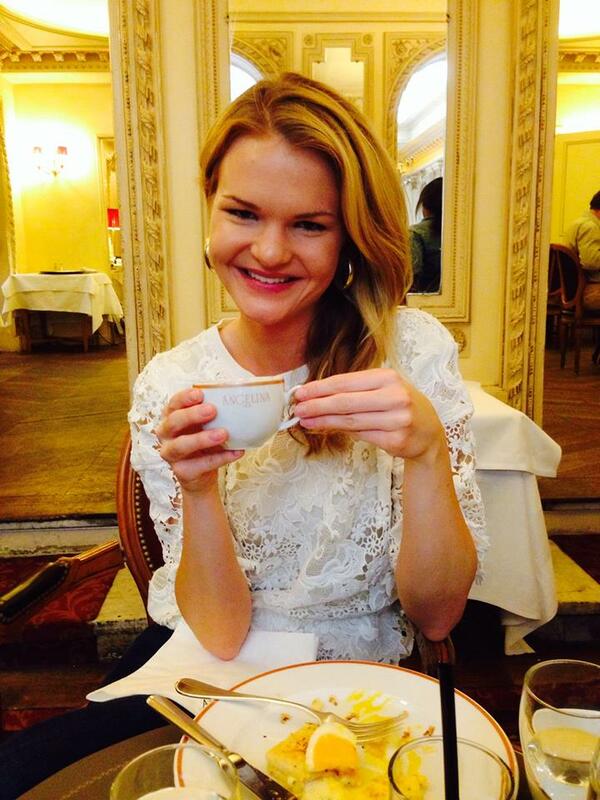 Coca tea for my altitude headache along with delicate pastries and sweet rolls made for a lovely light breakfast. 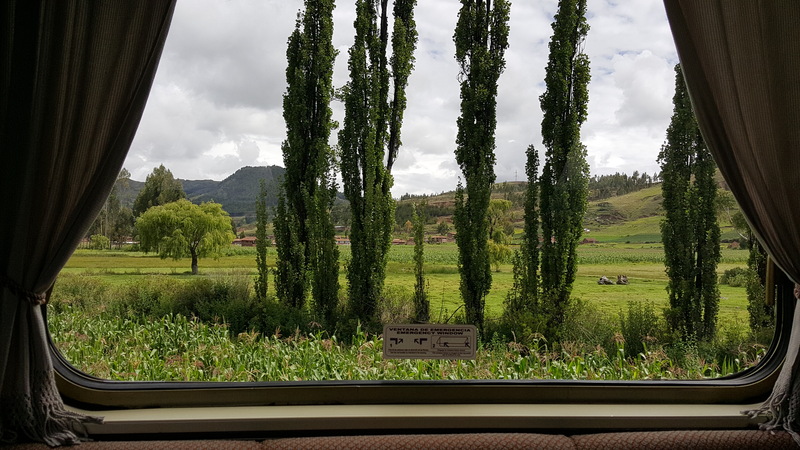 The plush armchairs and large windows in the lounge area of the car gave us a front row seat to a visual symphony of gorgeous fertile landscapes, rushing rivers, waterfalls, and emblematic animals like the llamas and alpaca. 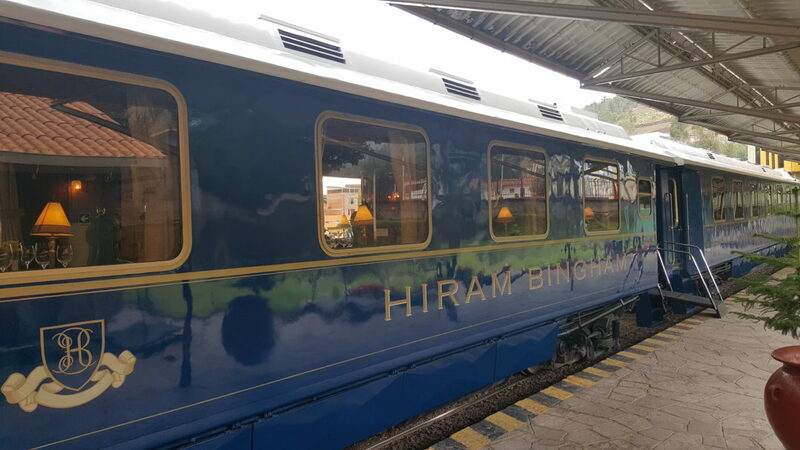 Coca tea on the Hiram Bingham train was more of a refreshing Moroccan mint, palate cleansing flavor experience than the no-nonsense medicinal coca tea from our hotel. The pain au chocolat and crescent rolls, while perhaps more Parisian than Peruvian, were so light and buttery that you felt as if you could be a 19th century Le Train Bleu passenger on your way to the south of France. They were very well done, and while perhaps not culturally accurate or indigenous, eating them with the smooth minty coca tea became an instant antidote to all my Bohemian existential angst. Coca tea definitely has a “cast all your cares and worries aside” quality to it. Let’s just say, Celestial Seasonings would fly off US shelves if they added that magical ingredient to their Tension Tamer tea. After a couple of cupfuls, a trip to the well-appointed restroom, and taking in the open air panoramic views of the valley from the small terrace at the back of the glass observatory car, tea time was over and lunch time began. We returned to our seats for the main food event. First to take the stage was the appetizer: Wayllabamba’s Smoked Trout with mashed fava beans, quinoa tabbouleh. All of the food served on the train is sourced from small organic family farms on the land the train travels through. Wayllabamba is the first campsite for those hiking the Inca Trail. In Quechua, Wayllabamba means ‘grassy plain’. But, before moving on from the opening act in this three part culinary concert, I must take a brief intermission to discuss the wine. We could have chosen to deviate from the white and red wine options included with our admission. They have additional bottles, including some from Europe, at additional cost. However, this whole experience was already feeling a little more Bougie than Boho, and we wanted to experience South American wines that went really well with the tasting menu. So, we stayed with what the sommelier had pre-selected for this meal. Accompanying our appetizer was a glass of Tacama Blanco de Blancos D.O. Ica, Peru. It was pale in color, very drinkable and refreshing. It reminded me of Cakebread’s Sauvignon Blanc from back home in Northern California. It was the perfect companion for the trout. The dry acidity in the top note helped the fish melt in your mouth, while the soft, sweet after taste it left behind nicely rounded out each bite. Upon finishing that glass, our red glasses were filled with a unique Merlot. The Montes Classic Series Merlot D.O Valle de Colchagua, Chile was unlike any Merlot I have tried. It had pinot-like tanins and a spice to it that reminded me of a Hess Collection red to compare it, once again, to wine from home. 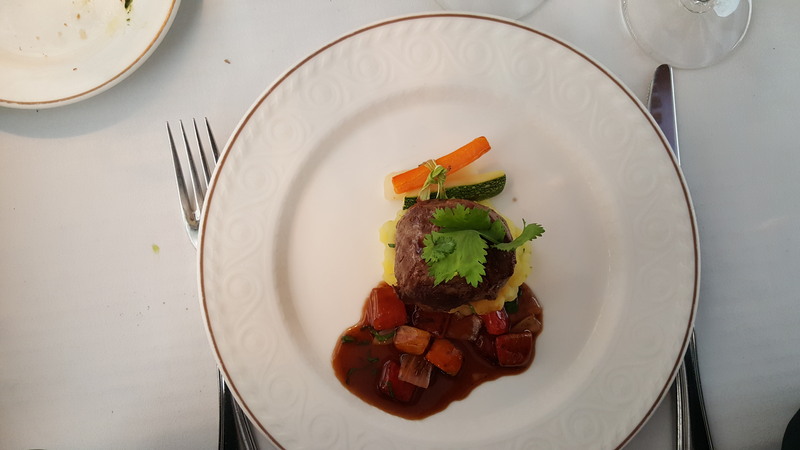 As soon as our glasses were filled with Merlot, the main dish appeared: Grilled Tenderloin Beef. The meat was tender and served with a traditional Peruvian sautéed sauce, rustic mashed potatoes, and a bouquet of colorful steamed vegetables. Each bite sent me straight to Inca god heaven. Last, but certainly not least, was dessert: Sacred Valley’s Corn Cheesecake. 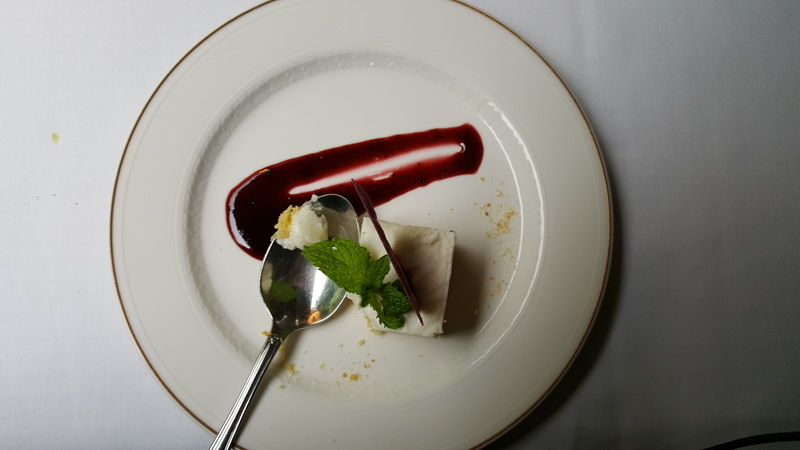 Its foundation was constructed from crispy corn flour, the next layer was a light cheese cake the top of which was garnished with a sprig of Andean mint and Chulpi’s corn praline. But, this was not all. There was a beautiful brushstroke of purple corn and elderberry sauce on the plate to dip each decadent spoonful of cheesecake into. The saying “It isn’t over until the fat lady sings” rings true once more here. 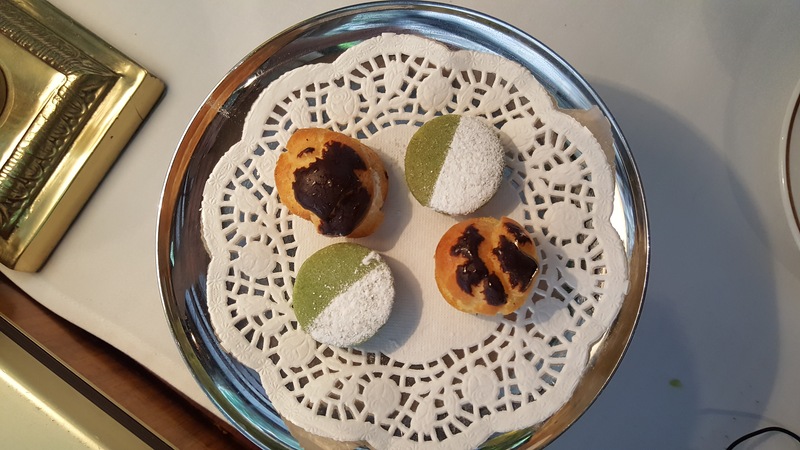 The final note of this exquisite culinary concert was a silver tray of cookies and Pâte à Choux washed down with freshly brewed coffee and cream before pulling up to Aguas Calientes station. 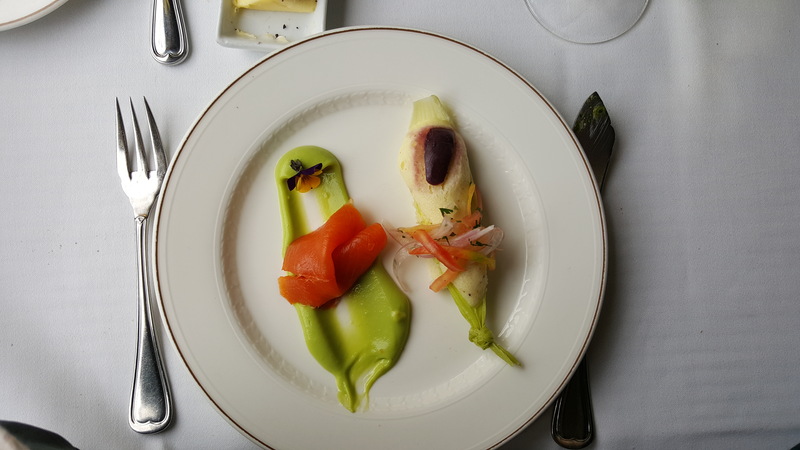 I was the fat lady, and my soul was singing after experiencing the transcendental meal and journey of a lifetime aboard the Hiram Bingham Train to Machu Picchu. This is the question art activist Jackie Sumell asked Herman Wallace in her first letter to the Louisiana State Penitentiary inmate in 2003. Little did Herman and Jackie know that simple question would develop into an international art project, a book, and a documentary each focused on opening doors by creating conversations about the issues with isolation, interrupting the status quo, and pushing humankind in the direction of compassion, kindness, and prison abolition. Numbers can be beautiful. They can be a means of communication; a way of creating a common language—the language of the universe—as physicists are wont to say. But numbers are also emotionless; they can be viewed as sterile and dehumanizing when they reference human beings. Indeed, most believe it is degrading to be seen as just a number. Those running prisons understand this psychology, and that is why when an inmate arrives, their name and human identity is removed and replaced by a number. In 1971 after being convicted of robbery, Herman Wallace entered the gates at Angola and became 76759. One year later, he would be wrongfully convicted of murder and spent 41 years in solitary confinement. 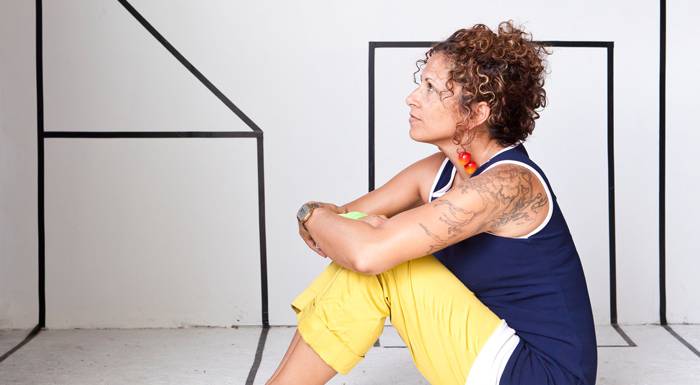 Solitary Gardens is at the intersection of public art, alternative land-use and social sculpture. The project imagined by artist jackie sumell, will utilize garden beds designed after six-by-nine-foot American solitary cells as a physical platform for collaboration, education, and commiseration to facilitate unexpected exchanges between persons subjected to solitary confinement and volunteer communities on the “outside.” The six-by-nine-foot beds are “gardened” by prisoners, known as Solitary Gardeners, through written exchanges with volunteers. The Solitary Garden’s beds become the classroom for prison abolition curriculum as well as portraits of those buried in a system designed exclusively to punish. Solitary Gardens’ ecological and social footprint will counterbalance that of the prison complex. As the gardens grow, the cells will be overcome by plant life, demonstrating that no matter what harm we humans impose on ourselves and the planet, nature, like human hope, love, and the imagination, will always win in the end. It was inspiring to watch and listen to her discuss elements of the project with me and a group of people gathered at Berkeley Art Museum last month. She told the story of Angola, sharing that the prison itself was built on what was once a plantation and the home to many slaves who performed the backbreaking forced labor to keep that plantation alive. The plants in the solitary gardens honor that heritage and speak to that history by planting plants like tobacco and cotton as symbols of slavery. 3 is another important number associated with Herman Wallace. This is because he was one of The Angola Three prison inmates – Robert Hillary King, and Albert Woodfox were the other two – who were put in solitary confinement in Louisiana State Penitentiary, a.k.a. Angola Prison, in April 1972 after the killing of a prison guard. All three of them maintained their innocence, and all three would eventually be freed. You can listen to an Amnesty International podcast featuring Albert Woodfox here. 3 is also significant because there is a 3 word phrase in the English language: “I love you” that, Jackie Sumell would say is the solution to wrongful convictions and the inhumane conditions of solitary confinement. Frontline | What Does Solitary Confinement Do To Your Mind? If a tree falls in the forest, does it make a sound? If an entire civilization, their culture and customs are erased, did they ever truly exist? What marks existence? Are the artifacts that are left behind, and the finder’s interpretation of their significance, the only landmarks we can point to when we map out the history of the human race? I wish I had nice and neatly packaged answers to each of these mindbenders. The truth is I don’t. But, today, I can offer insights into one beautiful “tree” that fell in a forest years ago and wasn’t heard until one fateful day in 1911. The morning of July 24th dawned in a cold drizzle. Arteaga shivered and seemed inclined to stay in his hut. I offered to pay him well if he showed me the ruins. He demurred and said it was too hard a climb for such a wet day. But when he found I was willing to pay him a sol, three or four times the ordinary daily wage, he finally agreed to go. When asked just where the ruins were, he pointed straight up to the top of the mountain. No one supposed that they would be particularly interesting, and no one cared to go with me. Little did he know that this treacherous journey would lead him not to Vitcos or Vilcamba or the mythical city of Tampu-tocco as he supposed. It would lead him to an undiscovered place, built by a lost civilization, the purpose of which is still unknown today. With Peruvian policeman Seargeant Carrasco and Arteaga by his side, Bingham left the wet camp around 10 am. After a short while the party crossed a small bridge spanning rushing water so unnerving that the intrepid explorer was reduced to crawling across it on his hands and knees. From the river they climbed a slippery slope finally reaching the ridge of Machu Picchu at around noon. I had entered the marvellous canyon of the Urubamba below the Inca fortress. Here the river escapes from the cold plateau by tearing its way through gigantic mountains of granite. The road runs through a land of matchless charm. It has the majestic grandeur of the Canadian Rockies, as well as the startling beauty of the Nuuanu Pali near Honolulu, and the enchanting vistas of the Koolau Ditch Trail on Maui, in my native land. In the variety of its charms the power of its spell, I know of no place in the world which can compare with it. Not only had it great snow peaks looming above the clouds more than two miles overhead; gigantic precipices of many-coloured granite rising sheer for thousands of feet above the foaming, glistening, roaring rapids, it has also, in striking contrast, orchids and tree ferns, the delectable beauty of luxurious vegetation and the mysterious witchery of the jungle. One is drawn irresistibly onwards by ever-recurring surprises through a deep, winding gorge, turning and twisting past overhanging cliffs of incredible height. Above all, there is the fascination of finding here and there under swaying vines, or perched on top of a beetling crag, the rugged masonry of a bygone race; and of trying to understand the bewildering romance of the ancient builders who, ages ago, sought refuge in a region which appears to have been expressly designed by nature as a sanctuary for the oppressed, a place where they might fearlessly and patiently give expression to their passion for walls of enduring beauty. His eyes weren’t the first to see the wonders of Machu Picchu. But, he was the one who made the most noise, and his noise would silence the other whispers that had rippled out before him. It is not true that Dr. Bingham was the discoverer of the ruins, but he did give them fame and archaeological interest. Before he came there, they were frequently ascended, and many people even lived there, cultivating squash, yuca, sweet potato, sugar cane, and corn. A Mr. Lizirraga, now deceased, knew the site in all its details. On July 14,1902, by the same road that Dr. Bingham took, a Mr. Sanchez, of Caicai, and Messrs. Enrique Palma and Lizárraga came to Machupiccho. But, as always happens, they had no scientific or historical interest. They were only interested in hunting for lost treasures that they thought were rumored to be buried in such locations. Cosio also mentioned that, when he visited Machu Picchu in 1912, he learned that Anacieto Alvares, one of the campesinos farming in the ruins, had lived there for eight years (BSGL, vol. 28., no. 22, 1912). As was the case with aviation pioneer Gustav Weisskopf, and his successful flight two years before the Wright brothers’, the people who make history are often standing on the heads and shoulders of people who were there before. There are innumerable reasons why one person is credited with discovery over another. 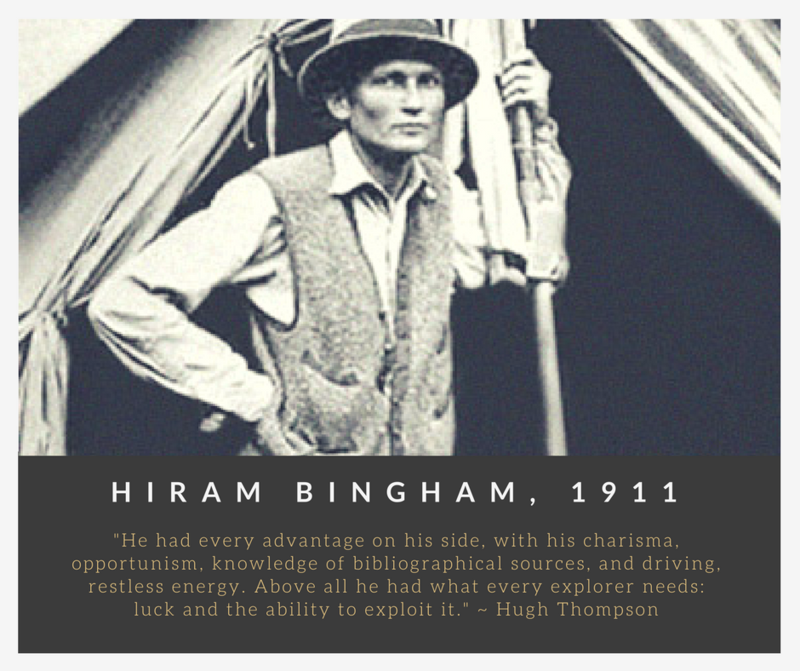 It is safe to say that Hiram Bingham’s story was heard around the globe making him and his discovery world famous. The beautiful blue of the tropical sky, the varying shades of green that clothe the magnificent mountains, and the mysterious charm of the roaring rapids thousands of feet below cannot be portrayed and can with difficulty be imagined… A stupendous canyon where the principle rock is granite and where the precipices are frequently over 1,000 feet sheer, presents difficulties of attack and facilities for defense second to none. Here on a narrow ridge, flanked on all sides by precipitous or nearly precipitous slopes, a highly civilized people—artistic, inventive, and capable of sustained endeavor—at some time in the remote past built themselves a city of refuge. Since they had no iron or steel tools—only stone hammers—its construction must have cost many generations, if not centuries, of effort. 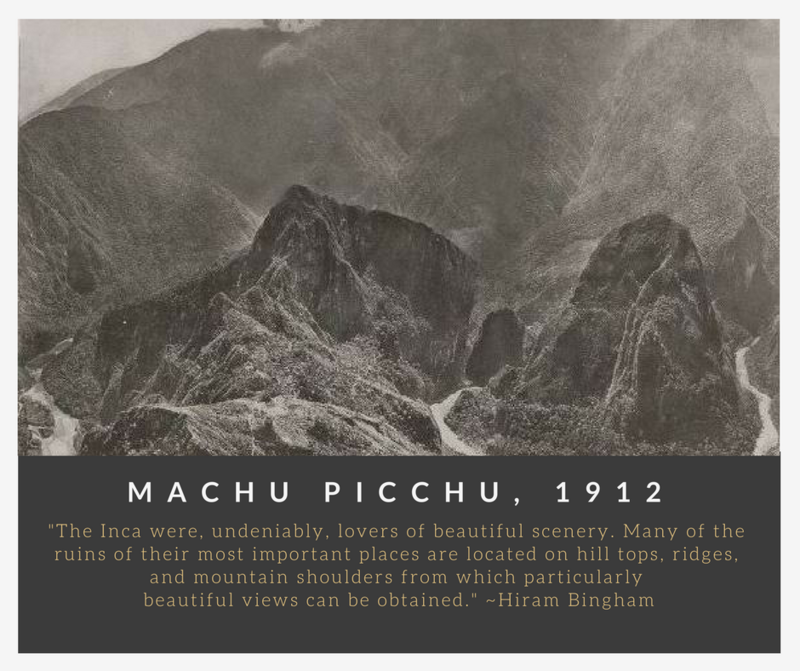 Bingham captured the ‘what’ of Machu Picchu: the physical evidence that existed in 1911. But, he would spend the 50 remaining years of his life trying to conclusively prove the ‘why’ of Machu Picchu. He proposed two theories, neither of which is accepted today. One of his theories was that Machu Picchu was a convent of sorts training women to serve the Inca elite. He developed the theory based on the fact that he thought 75% of the 100 bones he found on the site belonged to women. Modern science showed that this was not the case, and that the bones were actually closer to a 50/50 male to female ratio. His other theory was that he had found the mythical city Tampu-tocco, which legend has it was the cradle of the Incan Empire and the birthplace of the 3 fabled brothers who founded the civilization. He supported his theory based on the three windowed temple that was discovered at Machu Picchu. Today, other theories exist. Contemporary research conducted by archeologists John Rowe, Richard Burger, and Lucy Salazar-Burger indicates that rather than being a defensive stronghold, Machu Picchu was the Meso-American Martha’s Vineyard—a retreat built by and for the Inca ruler Pachacuti and other elite guests. 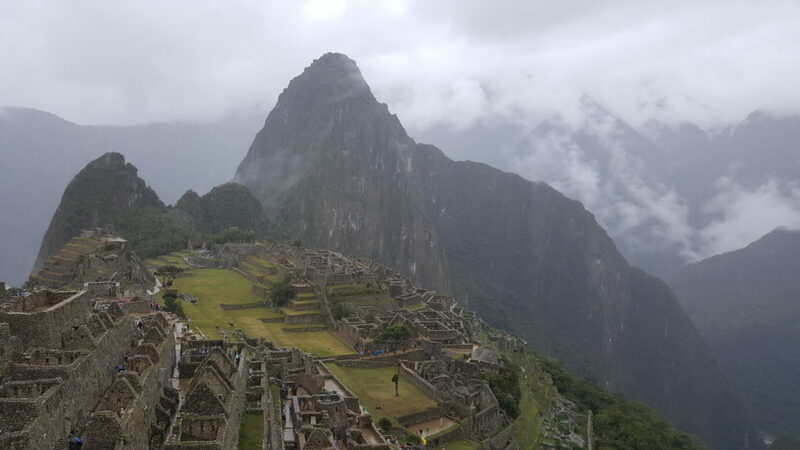 Brian Bauer, an expert in Andean civilization at the University of Illinois at Chicago and a National Geographic grantee, says Machu Picchu—which was built around A.D. 1450—was, in fact, relatively small by Inca standards and maintained only about 500 to 750 people. One thing is certain, says Bauer, archaeological evidence makes it clear that the Inca weren’t the only people to live at Machu Picchu. The evidence shows, for instance, varying kinds of head modeling, a practice associated with peoples from coastal regions as well as in some areas of the highlands. Additionally, ceramics crafted by a variety of peoples, even some from as far as Lake Titicaca, have been found at the site. ‘All this suggests that many of the people who lived and died at Machu Picchu may have been from different areas of the empire,’ Bauer says. 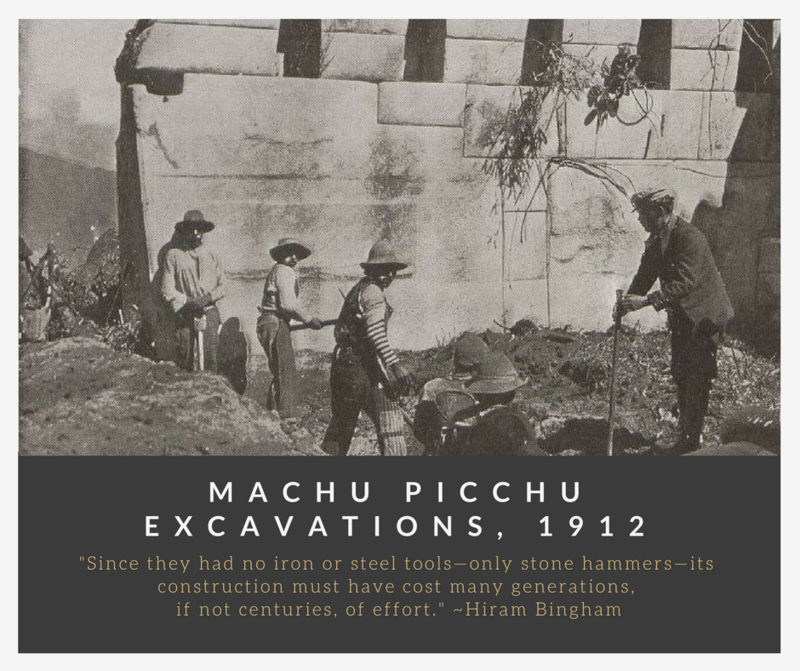 While the purpose of Machu Picchu is shrouded in much mystery, ultimately it can be said with certainty that the discovery of Machu Picchu proves that there are silent fallen trees in the forests of this world just waiting for a bohemian explorer like Hiram Bingham to hear them and make some noise. So, dear reader, the real question is: are you listening?